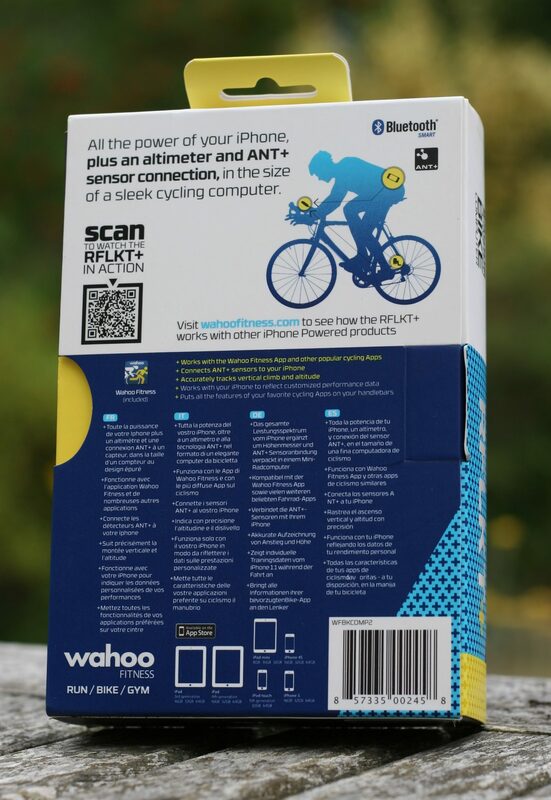 The WAHOO Reflect Plus (RFLKT+) is an interesting ANT+ bridging device and smartphone ‘screen mirror’ for cycling. Bridging devices convert your ANT+ accessory signals to Bluetooth SMART (Bluetooth Low Energy, BTLE, BLE, V4). 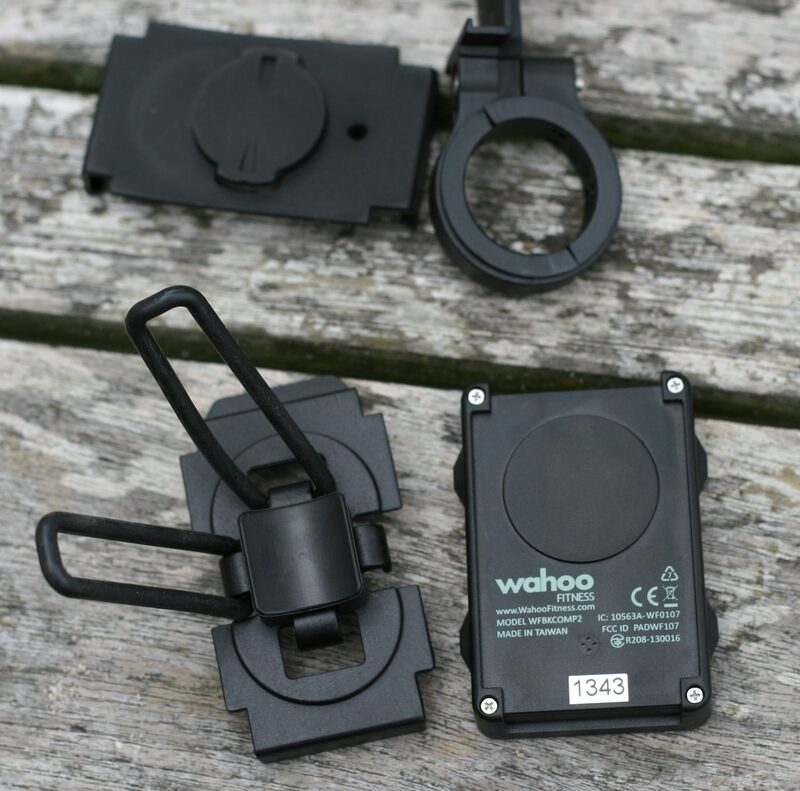 Whilst the two other notable devices on the market, the MIO Velo and the 4iiii Viiiiva V100, do this via the main unit (a Heart Rate Monitor), the WAHOO takes a different approach with the main unit being handlebar mounted. The RFLKT+ also requires an iPHONE/iPAD. 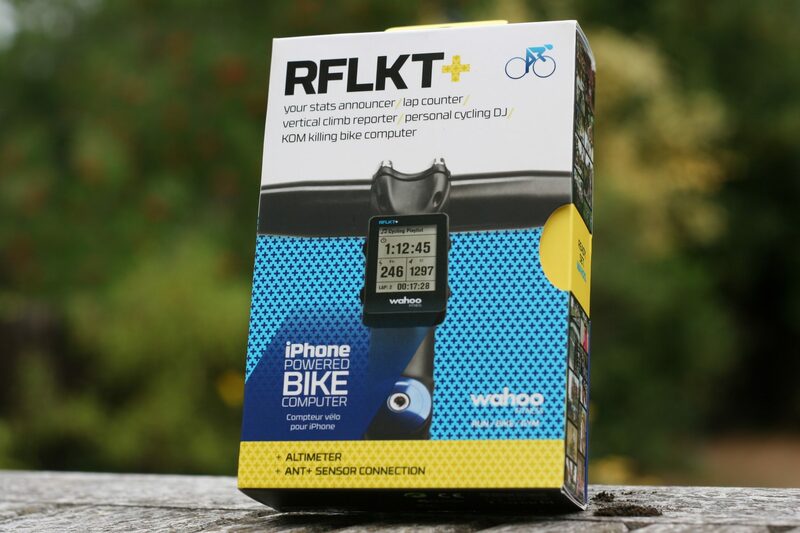 The Wahoo RFLKT+ mirrors the key data from your smartphone onto it’s own display which you mount on your handlebars. It’s smaller and lower powered – the batteries last longer on your smartphone if you turn the screen off! I’ll summarise the key benefits of this product and the differences to other product(s) in the range as well as giving a detailed review and further comment. 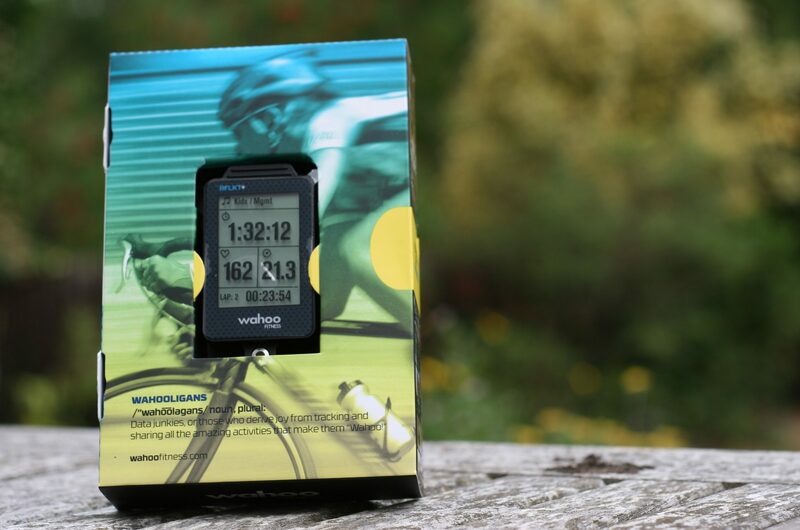 I initially had hopes for this device as a dedicated low-cost screen for the bike for racing duathlons/triathlons. However an iPHONE/iPAD is normally required and so that won’t work too well for many people for a variety of reasons. Of course many of you DO ride with your iphones so this is all for you ! 3. May well save you the need to buy a dual band power meter if you need BTLE from your ANT+ power meter. 2. Your iphone can be kept some more secure than on your handlebars. Think rain, crashing and theft! OK it’s a limited market ! But I suspect that many Garmin users may well now be looking further afield to broaden their in-ride functionality to include the functions that the likes of Strava deliver so well – as evidenced by the recent integration of Strava segments into the Garmin Edge 520. There is a RFLKT and RFLKT+. The RFLKT+ has ANT+ connectivity, a barometric altimeter and a thermometer. If you want the ANT+ connectivity then that part of the app’s functionality will only work on iOS. So if you only want to display the data from your BTLE sensors then you are fine on Android. Well it’s a nice box. What can I say? Here’s the back. Open up the fairly large box and you get your glimpse of the relatively tiny RFLKT+. In case you hadn’t realised, it’s a cycling product. Well, I said it was tiny. 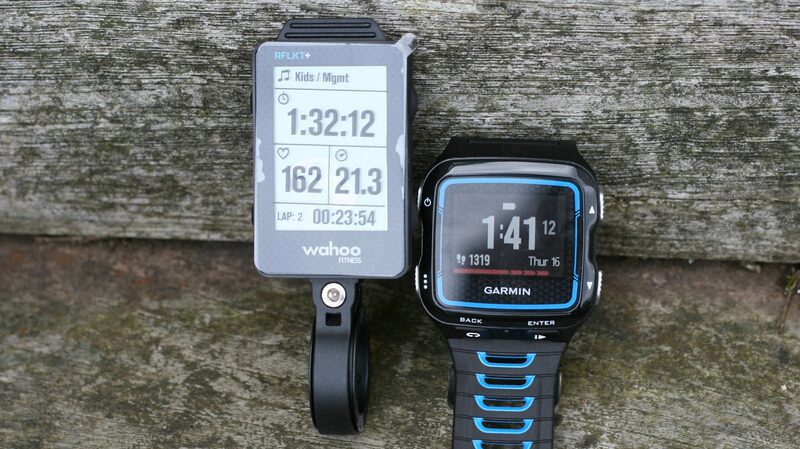 Here it is compared to the Garmin 920XT. It’s bigger than that. So; bigger than most wrist watches but with plenty of screen real estate. Enough for 6 data fields per screen – sometimes you just need more than 4 when you’re on a bike, trust me. You get a few bits too. You can mount to a standard handlebar easily enough and you can even have garmin compatibility with the twist off mount. So far so good. Assemble the 4-piece jigsaw and you’re ready to go. In case the 4 piece jigsaw was too complicated for you, you could instead refer to the boxed instructions. You’d be none-the-wiser however; as they are rather limited. Still; if you need instructions it’s too complicated – that’s what I always say. Here’s the problem. Tri-bars. You can attach the device easily enough but your arm covers the screen. This particular bike has flat/aero handlebars and so you can’t attach to that either. Garmin-fit mounts do exist for these needs but they do not come as standard. 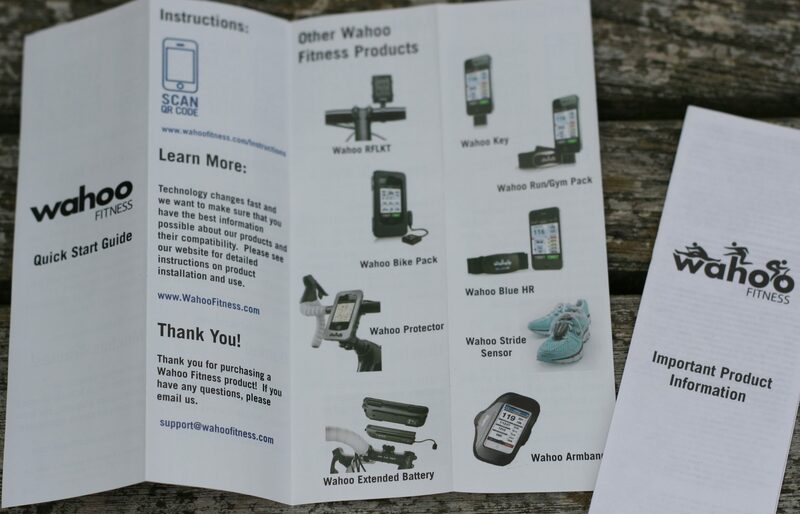 First, check the firmware on your device at Google Play using the Wahoo Fitness UTILITY. All this does is update stuff and test it’s working. The following slideshow shows you how you connect the RFLKT+ to the utility and then how you update the firmware. It suggested restarting Bluetooth but I rebooted my iPAD instead…just in case. I like the “Wahoo Fitness: Workout Tracker“. It does the job and tends to be able to find more obscure bits of non-Wahoo kit that some other apps fail to find. Being made by the same manufacturer as the RFLKT it is likely to be my best chance of first time success. So you add the new sensor and save it after remembering to turn on the ANT+ bridge. Simple. There are pages/displays already showing which you can change. There are other displays that are on the device which you can turn on and put them to use such as climbing/altitude/power displays. You can see the screen showing Power/30s Power/5min Power that already comes with these 3 metrics loaded. Instead I decided to create a custom screen showing 6 metrics/data fields. Just because I could. As you can see, the 6-field screen comes with 6 fields named ‘UNITS’. You tap and change each field. In a minute or so I had: Workout time; current heart rate; 5 sec power; instant power, current cadence; and current speed. That will do nicely. I had a problemette saving some of the screens; make sure you do it otherwise you have to re-start. That’s probably more of a problem with what I think is the non-intuitive nature of iOS sometimes. OK so we have the RFLKT+ set up to show data just how we like it. The only problem is that we have not told either the Wahoo App or the RFLKT where to get that data from. I decided to add an unusual non-Garmin power meter and the following Garmin branded sensors: HRM-RUN Chest Strap; Cadence Sensor; Speed Sensor. I have had problems with the power meter before and also with the Speed sensor. I think I am right in saying that I could use my Wahoo TICKR-X heart rate monitor to get both HR and cadence (yes, cycling cadence) but I didn’t want to make it too easy for the RFLKT :-). Simple stuff. Click on the arrow next to each of your individual sensors to configure them as needed, making sure they are assigned to your OUTDOOR BIKE and/or INDOOR BIKE sport profiles. Here you see the app with the sensor status pulled/dragged down from the top of the screen. The first image shows the sensors trying to attach and then second that they are all attached and good to go. Once they are all good to go you can hide the sensor display and use the main workout page or, of course, put it in your back pocket and use the RFLKT+. In INDOOR CYCLING MODE you may well choose to use the RFLKT+ AND the iPAD/iPHONE – I might do that just for the large iPAD display for example. But on the road the RFLKT+ will be in its element. One final image (I will have to update it, sorry it’s rubbish) that shows the RFLKT+, my Garmin and the iPAD all showing the same data. They sort of did (see later) but my photography skills let me down. I suspect that converting an ANT+ signal to Bluetooth is not as simple as it sounds. I suspect too that the market niche that Wahoo are aiming for here is fairly small. Anyway, they’ve done a good job and the process was almost painless. The ANT+ sensors took between 2 and 4 minutes to connect to the Wahoo Fitness: Workout Tracker. That’s too long. Support have been notified and I encountered a similar problem with the Wahoo app when receiving converted ANT+ data from the 4iiii Viiiiva V100 ANT+ Bridge (Strava was fine with the 4iiii). 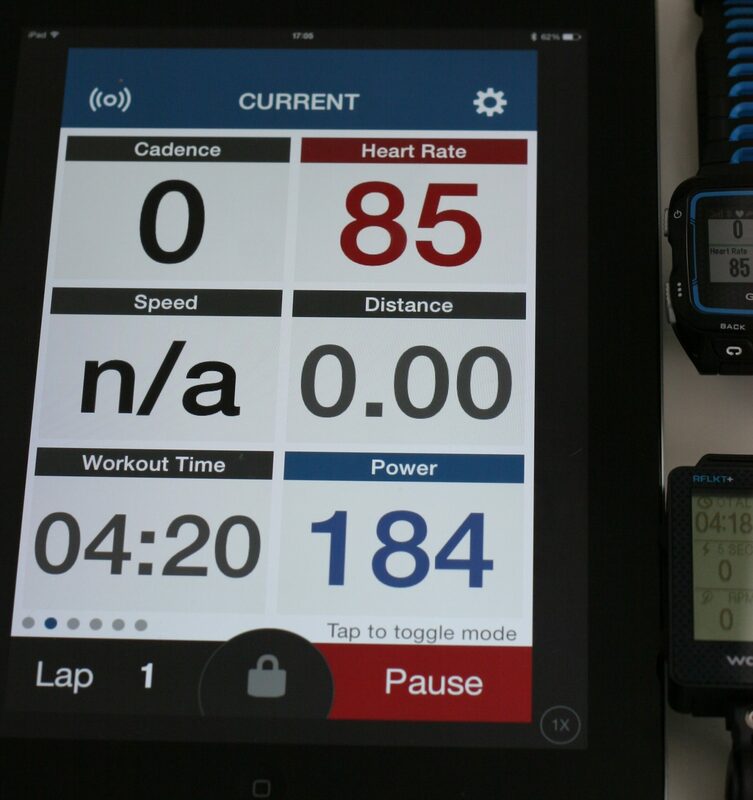 There is a slight discrepancy between the iPHONE/PAD, RFLKT+ and Garmin for the actual data. The discrepancy is a fraction of a second lag and is noticeable if you are really trying to look for it. I suspect this is trivial and not really a problem. The SPEED and DISTANCE data did not work (GPS turned off). Both should have been coming from the GARMIN SPEED-ONLY sensor. The data shows fine on my 920XT. I had a problem with this doing a similar thing with a 4iiii product so it may not be an issue with WAHOO – seemingly the problem could be the Garmin sensor’s adherence to the ANT+ specification but that sounds doubtful so I will speculate no further. The ANT+ bridge only works in iOS ie NOT Android. MIO Velo: Speed and cadence only. No HR conversion as BTLE and ANT+ HR comes from the Velo device. Firmware upgradeable device. Power support is supposedly planned. Optical, wrist based heart rate monitor as well. Converted data is sent to your smartphone (iOS or Android). 4iiii Viiiiva V100: Speed, cadence and power supported. No HR conversion required as BTLE and ANT+ HR come from the 4iiii device. Firmware upgradeable chest strap. Future firmware upgrade ARE being actively worked on for new features. Converted data is sent to your smartphone (iOS or Android). 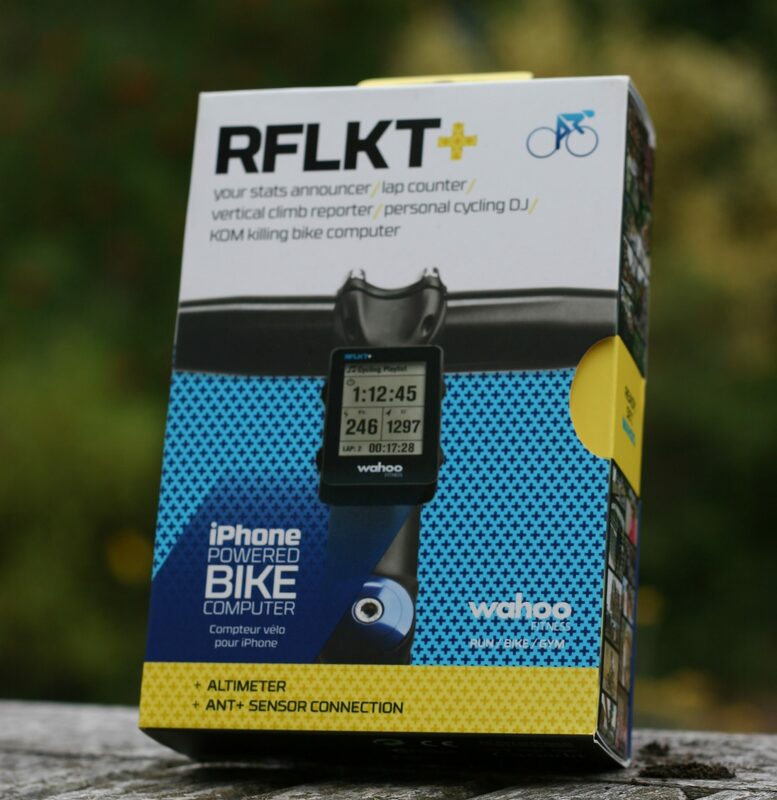 Wahoo Fitness RFLKT+: Speed, cadence, HR and power supported. Also adds temperature and barometric-based altitude (RFLKT+ only). Firmware upgradeable device. Converted data is sent to your smartphone (iOS only, RFLKT+ only) and the smartphone app sends whatever data it has to the RFLKT/RFLKT+ (iOS or Android). If you want optical on the wrist and a minimal ANT+ bridging feature thrown in then that’s why you buy the Velo. If you want a great little handlebar device that converts data and saves your smartphone’s battery then you go for the RFLKT+. The Viiiiva V100 gives you a superior Android option and promises more goodies with future firmware updates this year. It’s a great option for indoor usage as well as outdoor usage, providing that your rides never exceed the battery life of your smartphone. So this is a nice market segment. 3 products doing essentially the same thing but in ways that appeal to different people. I’m sure one of them has YOU covered. Don’t forget to look at the previous paragraph summarising the competition. 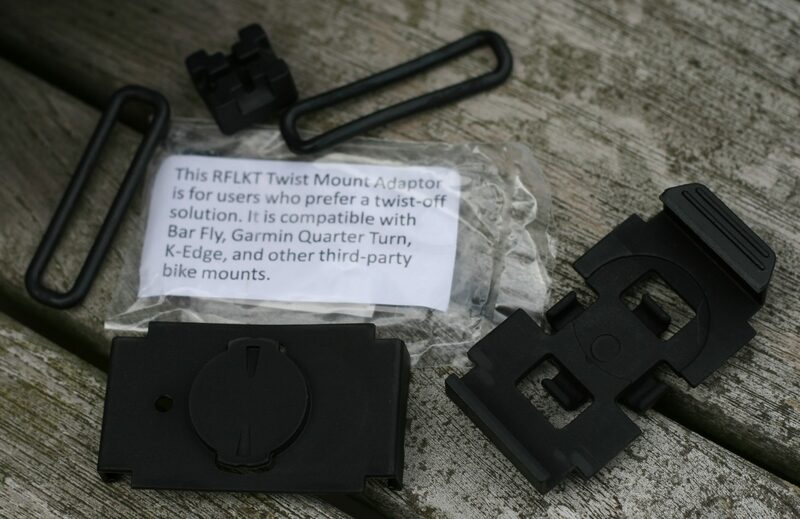 The RFLKT+ is a great product for longer-riding riders with iPHONE battery problems and who either have an ANT+ Power Meter or who want a more compact handlebar display than offered by the iPHONE or who might simply want to keep the iPHONE safe and dry in their bag. If you buy from one of the links below you support this site in a small way thank you. Quick question. I have RFLKT+ , but i want to buy Garmin 920xt. Would the RFLKT+ become useless then? I can’t find any data about pairing those two and I am not sure I need to do that anymore since all data from GArmin would be on my wrist. you cant pair the two together. is t then useless? depends on your sensors.